This punchy, portable cab is ready to rock. 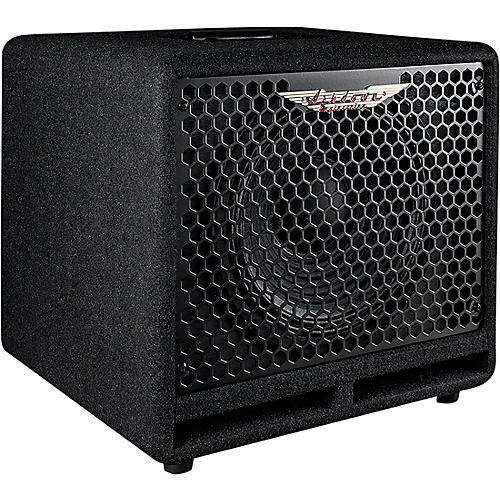 The Ashdown OR-110 150W 1x10" is a front-ported lightweight 1x10" cab with a custom designed Ashdown speaker. The cab is constructed of premium grade far eastern ply. The cab is wadded to retain specific frequencies while the tuned reflex port allows for more air to be moved giving the cab a surprising volume. A perfect fit with the Ashdown Original 300 head or the cab can be run as an extension for the OR-C112 combo. Rated at 150 watts at 8 ohms the OR-110 is one of the most portable cabs on the market. There is a top-mounted grab handle positioned to offset the weight of the speaker magnet for ease of transport. Pairing two of these cute little cabs provides enough volume to keep up with most drummers and sits very well as a personal monitor, what with the OR-300 head’s on board DI to feed the front of house PA the new cabs are the perfect addition to the Ashdown range. Ashdown have focused their product offering over the past few years delivering some really inspiring products focused toward the bass players needs, the OR-110 sits on its own in the range as this cab really delivers everything you need from a compact rig solution.